Your little man will love saying thanks with these adorable everyday notes. With so many styles, finding her the perfect card is easy. 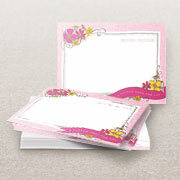 Give them a reason to write those thank yous with cool notes designed for them. It can be a never-ending struggle to have your child finish their thank you cards after a birthday party. Shutterfly can help you get beyond the struggle and turn thank you card creation into a fun experience for everyone. One trick that seems to make all involved happy is to allow kids into the whole process. From beginning to end, let them create their own way of thanking everyone. An exciting way to say thank you could also be an excellent photo op: take a picture of your child either wearing or using the gift, upload the image to Shutterfly and choose an easy-to-use template to get you started on the project. From there, let our design assistant help you create the card. Have your child add their own heartfelt messages of gratitude. With both flat and folded cards, in a selection of sizes and paper types, it’s easier than ever to find the perfect thank you card for your gift-giver. Add a little extra flair to your project with customized self-inking stamps sure to enhance your thank you card envelopes. Available in several designs, including monograms and family names, there is something for everyone. 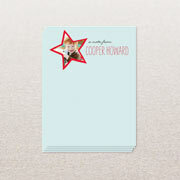 Or send your cards out in style with personalized address labels. They’re the perfect way to finish off your child’s thank you cards and give them a little extra encouragement to send more personal greetings.